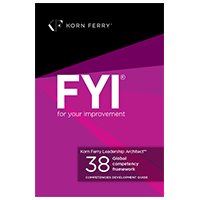 FYI® for your improvement is an easy-to-use development tool that features a chapter of actionable tips for each of 38 Korn Ferry Leadership Architect™ competencies and 10 career stallers and stoppers. 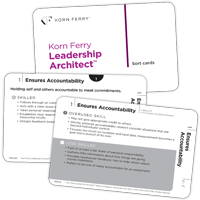 The Korn Ferry Leadership Architect™ Sort card deck is made up of single cards devoted to each of the 38 Korn Ferry Leadership Architect™ competencies, as well as their corresponding factors and clusters.Each card includes the skilled, less skilled, and overused skill definitions. 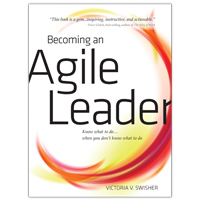 Becoming an Agile Leader explores the five key characteristics, or factors, of Learning Agility– a proven success differentiator for leaders. Spotlighting well-known leaders from business and the world stage, Becoming an Agile Leader is filled with more than 70 practical development tips you can start using today to increase your own agility and help ensure success in new, challenging assignments. 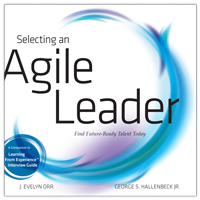 Take the guess-work out of identifying high potential talent in the interview process with Selecting an Agile Leader.